Half the fun of flipping through a glossy magazine editorial is getting lost in the fantasy: Beyond the spectacular clothes, it's the lavish sets, opulent details and dramatic settings that sell the fairytale. 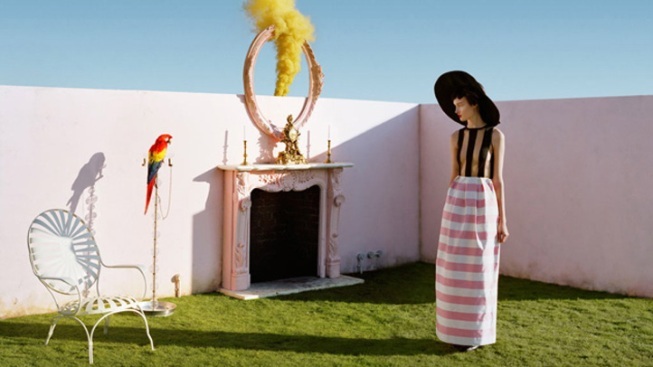 Art director, set designer and prop stylist Rhea Thierstein is one of the chief engineers of these fashion fairy tales. Her outrageously creative set designs and peculiar props seem to defy reality and occasionally, gravity: One of our favorite Thierstein projects, for example, depicts an enormous ship caked in ice, come to rest in a white living room. We caught up with Thierstein to see how she got into the business and how much of what she does is actual magic. How did you get into the set design and prop styling business? I discovered Shona Heath during an internship when I was in my final year at university. I didn’t know that such a career existed and which let’s you be creative in many different ways, using lots of different techniques. I assisted Shona for 4 years, which gave me a great insight and induction in to the industry. She was a great mentor. Not really. My Dad is quite creative. I was always fascinated with making things and craft techniques. From the age of seven, I would draw, paint and make things everyday. I loved it. My first shoots were terrifying! I think the first shoot I did was for a music band. I had to make lots of different objects out of tinfoil. The main turning point I remember was the shoot I did with Tim Walker with Monty Python for Vanity Fair. I made hats and props for them and set smoke bombs off. It was a lot of fun and was the first defining moment for me to pursue set design and prop styling as a career. What goes into prepping for a shoot; how do you work with photographers, designers, what have you to come up with a concept? Every job has been really different so far. Sometimes the photographer or client already have an idea of what they want me to create. More recently, I’m being approached a lot more to come up with ideas for a brief, so I present them with ideas of how I would like to do it. I normally do a lot of research, and then edit the references, which help to spark ideas. Where do you typically source your props and materials? Again, each job is very different, so I don’t have typical sources. It’s mainly searching the internet. I find good props on eBay – you can find the most amazing and weird things on there! I also use prop houses, but prefer to make the props myself, if I can. What was the weirdest prop you've ever had to source: where did you find it/how did you build it? My wasps for my Selfridge’s window were pretty weird. I made them from chicken wire and papier-mâché. They were huge and took my team and me nearly 10 days to make. Does your job sometimes require you to be a bit of an animal wrangler? I do have to source animals. We recently did a shoot with a Scarlet Macaw. That was quite hard to find, as there aren’t many of them around. I have a couple of animal agencies who are very good for animal sourcing, or I contact societies specifically for the type of animal I’m after, who can usually help. I don't wrangle them though, the animals have a keeper who comes with them to look after them. Is there a look, or particular "niche" that you're known to design for? I like to use colors, which are quite washed out and feel old. I try and create an atmosphere to make the image feel real. I love detail in the sets and objects I create. I think my work is imaginative, quite surreal and delicate. What's the most challenging thing about working as a prop stylist? Each job is always very involved. There’s always a lot to do, source and make. I have to juggle a lot of different things and be very organized as time is never on my side. Things always take a long time to make and source, so I work most hours of the day. An animal conservationist. I’m fascinated with nature, tropical environments, and the animals and insects that inhabit them. I’d love to be able to be a part of wildlife conservation.